First Second Week continues with an amazing guest Graphic Novel Review of Primates by high school teacher and fellow Comic Book Teacher Adan Alvarado. 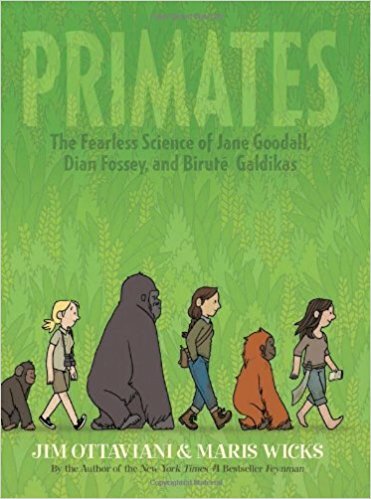 Primates provides a humorous, thoughtful, and often heartbreaking account of the Trimates (Goodall, Fossey, and Galdikas) and their escapades as Ottaviani (author) and Wicks (artist) attempt to scratch the surface of these incredible women. Ottaviani (author of the equally powerful Feynman) anchors these larger than life women in the humanity that drove them up mountains and into swamps and jungles. He does this by allowing the adversity each woman faced in the pursuit of their destiny to simmer with the reader. Ottaviani does not seem interested in having the conversation; he is only looking to plant the seed of one. The Trimate’s stories bring up the issues with a workplace established for the patriarchy and how elements of that foundation continue to linger. It poses the question of whether passion, intellect, and grit is enough (topical in a day and age in which many young people are opting to pass on college). A moment in Goodall’s work can be viewed as condemnation of a society that is swayed by “reality” news. Similarly, a story about Galdikas points out the exploitative “truthy” quality of entertainment journalism, and the dangers of normalizing that which is not (never a better time for that warning). Each woman’s foray into their field of study is laden with larger philosophical questions (violence as learned behavior, starter children, and the ethics of research and funding), but the novel also provides welcomed levity every time the eccentric thread that sewed these women together appears on the page. Louis Leakey is the philandering archaeologist that helped foster the field research that the Trimates ultimately made famous. Leaky is presented as the fast thinking, and even faster talking salesman who uses words as a currency. In large part Leaky works as a foil to the primates themselves. He is everything they are not except for the single fact that neither can function without life’s single greatest tool: language. While Ottaviani focuses on the language, Maric Wicks uses her art to enhance the story, but never distract from it. Her art is purposeful in the most impressive way. There is a fluidity to her six panel format that only shifts when the moment calls for it: there are frames that utilize onomatopoeia in a way that illustrates sound has superseded sight, a frame that not only gives you a gorilla’s P.O.V. from a location standpoint, but from qualitative perspective as well, and an eight panel page depicting a gorilla chest-beating ritual is flat out flawless. Both Ottaviani and Wicks blend their considerable talents beautifully to give us a story about three women and their primates. A story of three individuals who willingly sacrificed their youth, health, and relationships for what they loved and held to be true, and then… shared that truth with the world.